Directions: From junction of US-60E & Rt. 32 at Rodburn, go east about 5 miles on Rt. 32 Christy Creek Rd. Barn can be seen at left. Notes: Tobacco barn was built in about 1970 to replace a smaller old barn that had been built in 1920 by the Lewis’ grandfather. “Old Maid’s Puzzle” is the name of the eighth quilt square designed and painted by the Foothills Quilt Trail Committee. 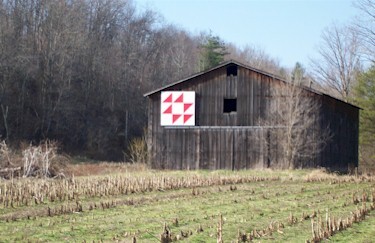 The quilt block was hung by several employees of Grayson RECC on a tobacco barn on the Lewis Farm located about five miles from US-60 on Christy Creek Road. In 1907, John Anders & Sara Alice Adams Lewis bought the farm on which they raised their ten children. Of the ten children (Marie Lewis Adkins, Lula Lewis Eldridge, Kenneth Lewis, Sue Lewis Coleman, Berniece Lewis Barber, Ruby Lewis Vencil, Vivian Lewis Heitz, Juanita Lewis Gais, Johnny Lewis, and C. Roger Lewis) only Ruby & Juanita are still living. A barn was built on the old homeplace about 1920. Some of the timbers used to build the first barn came from the Rowan County courthouse that had burned down. Then about 1970 the old barn was torn down and replaced with a larger one used exclusively to hang tobacco. Some of the wood from the original barn is in the home of Betty Lewis, wife of the late C. Roger Lewis. Their sons, Steve and Mark, inherited the farm. They sponsored the quilt square and chose the pattern because of its pretty design and the bright red and white colors. The local quilt square committee is interested in trying to place quilt squares on barns and other structures throughout the entire county. This group has recently adopted the official name of “Foothills Quilt Trail” and has joined the Kentucky Quilt Trails Project. For more information, call Jean Cline at 784-4568 or the Morehead/Rowan County Tourism Office.